Another model of a London Underground tube station. 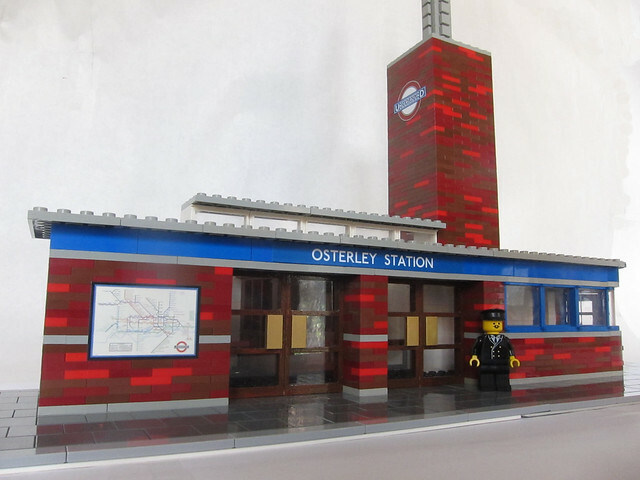 This time it's Osterley station on the Piccadilly line in West London. This is beautiful and AWESOME at the same time 'AJW', but the brown doors and curved windows are from where ? I've asked in the past, but please say you try for a Woolworth store next ? Keep them coming 'AJW' ! Your creations are not for the purists as they involve modifying and painting, but my oh my does the end result look great :) I love the brickwork and the custom stickers. Yes as others have said, the end result is fantastic. The brickwork, custom stickers, and design is great. Also, how exactly did you make that curved window? 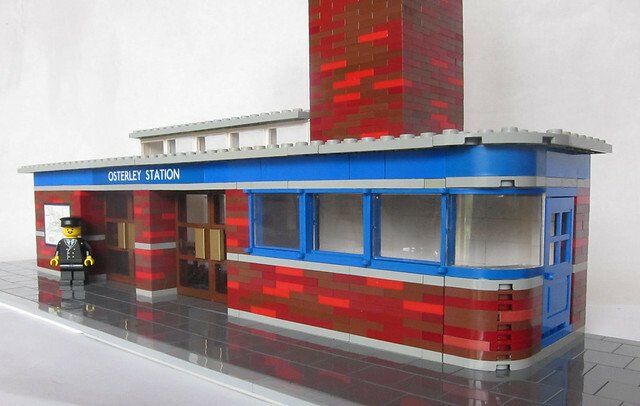 I always enjoy seeing the tube stations you transform into LEGO, and while this is maybe a little smaller than some of your previous builds, it is of the same very high standard. It really (like the others) reflects the architectural style of stations built in that era, and I especially like the curved wall of the waiting room. The brick-work is terrific, truly! Great looking station! I love the bricklook you've added to it! 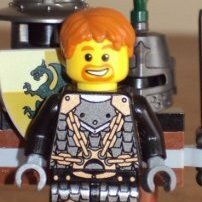 What a fantastic looking MOC. Thanks for sharing it with us. Wow great work I love the LEGO brickwork. But that curved window is new to me where did you get it? The bricks effect is awesome! Thanks guys and gals for your kind words. I know it's a bit controversial painting and modifying parts, but what can you do if the parts you need to recreate a building don't exist? Well you have to improvise! That curved window is genius. I never would have thought of that. Nevertheless, you modified some bricks to give this creation an extremely elegant look. It's an amazing creation, and when you're able to modify bricks to make them look like they're commonly produced, it's worth it (I'd probably ruined them). Also, the custum stickers give a great effect. Well done!